A part of Hyderabad's Charminar has fallen off after heavy rain in the city over the last few days. The 400-year-old monument is a Hyderabadi icon and a national treasure. An ornamental portion of one of the four minarets has crumbled away. The poor condition of the monument - obvious to any visitor - has been begging for attention. 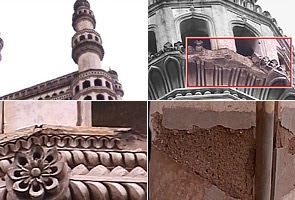 Experts from the Archaeological Survey of India (ASI) say restoration will begin after the monsoon and that despite the portion that has fallen away, the basic structure of the Charminar is stable.